Seniors can develop balance problems, causing them to feel dizzy and unsteady on their feet. Everyone needs good balance to get around, to maintain independence and to perform daily activities. Mobility is an essential requirement to live an independent life, and it is especially so for seniors. According to the Center For Disease Control and Prevention, one-third of adults 65 and older fall each year, making it the leading cause of injury related deaths. Fall related injuries like hip fractures can seriously affect the daily life of seniors. If you are involved in elder care in Toronto, be aware of the causes of balance problems in seniors. Certain medications, low blood pressure, smoking, diabetes and poor vision can all contribute to balance issues. Losing strength in the muscles, hips and legs can also create balance problems. 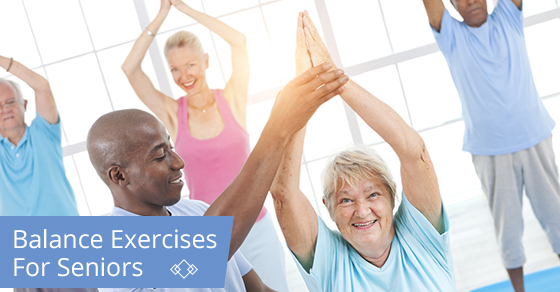 If you have noticed a senior having difficulty getting up from a chair or climbing stairs, here are some balance exercises to help minimize falls and injuries. Be sure to supervise them as they perform the exercises until they have mastered them. Hold on to the back of a chair. Lift one leg behind you and balance on one leg. Hold that position for a few seconds. With practice, try to work your way up to a minute. Do the same with the other leg. Do this every day. As you get more comfortable, let go of the chair. Use a chair for safety kept near your side. Starting with both feet together and both hands at your side, step forward, with one foot directly in front of the other, and hold for 15 seconds. Use the chair if you need it. Practice doing this alternating feet. Be sure to wear flat comfortable shoes when doing any exercise. Sit comfortably in an armless chair. Use a yardstick, an umbrella, a baseball bat, anything long and light. Place the yardstick on one hand vertically, focus on the top, and try to balance it for as long as you can without leaving the chair. This one can be a fun way to challenge younger members of the family. Find some strong masking tape and place a 5 foot long piece on a hard surface floor. It might be wise to have someone do this for you. Begin to walk on the masking tape balance bar, with one foot directly in front of the other, like an Olympic gymnast. This seems easier than it really is. Take a small stuffed animal or similar soft cushion, then practice stepping over it with each foot. Finding ways to improve balance for seniors in Toronto is at your fingertips. If you need home care services, Contact C-Care Health Services.